May is a good month, and a month of total awaking for nature! Everything comes back to life in their glorious beings. From flowers on the ground, to the tree branches on top! All have come back to affirm new hopes and dreams. This mosaic includes all the flowers that have come and gone! New life is sprouting and new weed flowers are growing. May is a good month and a month to discover new things. Beautiful blooms! 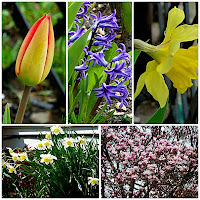 Spring is happening here slowly, but we had snow yesterday! Beautiful flowers, they really are cheery. Have a happy week ahead! april showers bring may flowers, not so true here in san diego since we did not have april showers, so, our wildflowers are disappearing now, but there are a lot of flowers in the human cared gardens. love your photo and mosaic always. Ahhhh - gorgeous spring flowers! Lovely floral theme for the day! Beautiful pictures. Love your first shot, it really glows. 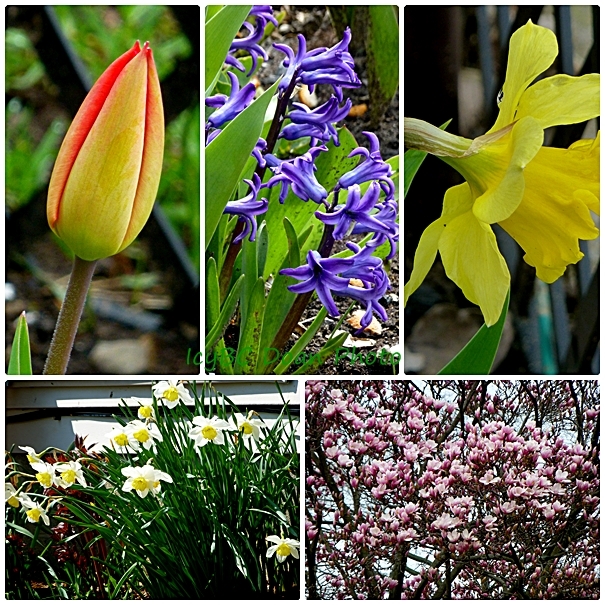 Love those Spring flowers so much!